These low carb chocolate peanut butter balls are a lifesaver for me. They are actually better tasting than the store bought chocolates we all love that also have cancer causing ingredients that help to preserve them and keep them on the shelf longer. If only I found this recipe before I ate those 4 little chocolates on Halloween which made me go up something like 3 pounds. Ugh! Oh well I know what to do the next time I have a craving for chocolate. 1) Melt the chocolate. I like to pour boiling water over it, let it sit for 2-3 minutes, and then pour the water off. That way I know I won't burn the chocolate. Sounds crazy but it works! 2) Mix in the rest of the ingredients, adjusting coconut sugar to taste. 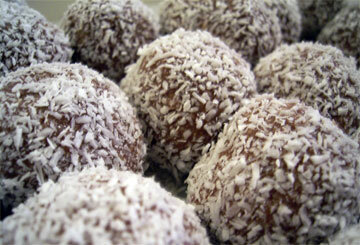 3) Cool to room temperature, take a tablespoon of mixture and roll into balls and dust with cinnamon and coconut sugar. You can also dip them into your own homemade whip cream and they are to die for. Just this much of the recipe gives me enough to have a few of these every night for the whole week. ***Note*** I originally wrote this article in 2009. Today it is 2016 and since initially writing this I have learned and discovered much more about the HCG diet. Today I make this recipe with coconut sugar and not artificial sweeteners so I updated this recipe as well. The reason is that it has less of an affect on our glucose levels and it is a safer option for diabetics. So in other words it won't cause my weight to rise like regular processed white sugars would. At the same time I am trying to lose and maintain my weight and not blow up like a balloon I also want to live free of cancer so I have completely removed all artificial sweeteners from my diet and I now use raw organic honey very sparingly because it is obnoxiously sweet and coconut sugar when needed. I like this version so much better than the previous version of artificial ingredients. I hope you enjoy it too.